This game is a favorite of mine. It is a very good basic exercise for the gun dog training as well as a great exercise for puppies, but it can be trained with any dog, regardless of age. It’s a game – of course – where the dog actually will practice a variety of things that are useful in the gun dog training. The exercise is described in the book, but I want to give you some details about the game and show you a film in which you can see how I use the game with my dog Tassla in the gun dog training. In the book we call this game the “Switching Game”. You need two identical toys that the dog should learn to switch between, on cue. For you to be able to play this game with your dog it is important that she likes to play with toys and also likes tugging games with those toys that you offer. The dog doesn’t need to be very good at holding a toy because this game will also help your dog to get better at that. In this film you can see Anna Barnö training with her toller Alice. Anna and Alice have just finished my puppy training class, and during that class Alice learned to hold objects better, release the object on cue and hold the object and release it first when she hears the cue and come back quickly and easily. In other words basic exercises for gun dog training – and all this she learned through just one game. Before Alice learned this game, she and her puppy pals in the dog training class learn the game “Playing is Something We Do Together” which you can find on page 26 in the book. That is a basic exercise that you can start with if you have a very young dog or a dog that loves to play without you taking part in the game. With the help of this game you might train to grab quickly, hold an object, come back at full speed with the object, releasing it on cue, and not to run to pick up a toy without a cue – and actually even steadiness! In addition, you and your dog have a lot of fun together and that might be perhaps the best of all. With other words a great game! Doesn’t a dog get ‘hard mouthed’ with this exercise?! No, in our experience they don’t get hard mouthed. 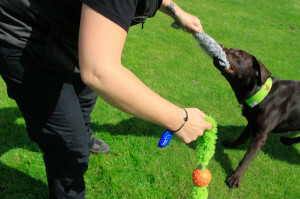 The dog can very well diffrentiate between a toy, a dummy and game – and it’s all about how we teach it how to carry different items.